The 71st annual Golden Globes were held last night at the Beverly Hilton Hotel in Beverly Hills, Calif., and the stars certainly came out in their best glitz and glamour, waiting in anticipation for the golden orbs to be presented. But before Jennifer Lawrence picked up the first award of the night for Best Supporting Actress in a Motion Picture, she may have caused the best "photobomb" in Golden Globes history. 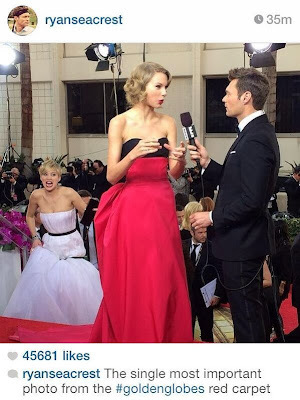 While Ryan Seacrest was hosting a red carpet interview with Taylor Swift, Jennifer had arrived and was making her way up the stairs to await her interview, according to Perez Hilton. It appears as though Jennifer may have been trying to sneak her way up the stairs, but the face she made while doing so was priceless.